We sadly note the passing of Bruce J. Lehr of Southold, NY who passed away peacefully at his home April 8, 2019. He was 81. He was born January 23, 1938, to Margaret (Smith) and David Lehr. Bruce served in the military for two years, then became a mechanic for Tryac Truck and Equipment and later at Southold Town Highway Department. He was a 56-year member of Southold Fire Department and a longtime member of the H.H. Franklin Car Club. 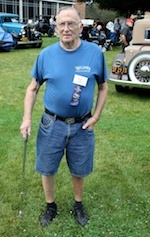 He enjoyed restoring, driving and showing his antique car collection. We sadly note the passing of Joan Doman. Joan was the wife of Dave Doman and was a long-time friend of the HH Franklin Club, which seems to have been the one exception to her rule at home, "No car talk allowed." (Except, apparently, for Franklins and the Franklin Club.) She had many friends in the club and attended many Treks with Dave and continued those friendships long after his death in 1987. Joan was born in East Syracuse, NY, on April 3, 1925. Her love of the outdoors began at a young age when her father took the family on many outings for swimming in nearby Green Lake. Her love of music began as her mother taught her piano, which she played the remainder of her life. Joan became a nurse after studying at Syracuse University and she worked at the Mayo Clinic in Rochester, MN. She left that much loved position in order to take advantage of an opportunity to visit her sisters, who were working in Berlin after World War Two. On her return to New York, she met and married David Doman, to whom she was married for 37 years. They moved to Ann Arbor, MI in 1956 where they raised their four children. Joan played tennis into her 80s and piano into her 90s. She loved to garden and enjoy the natural world. Joan had a love of adventures large and small, including the opportunity for the family to live in Australia for three years. She was often found volunteering at the Matthaei Botanical Gardens, teaching school children about the natural world around them, or taking Project Transition residents on outings. She influenced the lives of those around her through her quiet example of generosity and good. Most of all she loved being with her grandchildren and great-grandchildren. 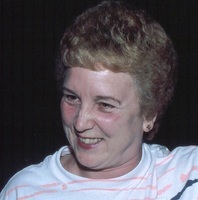 Joan was preceded in death by her husband, David Doman, and is survived by her four children, Mark (Jane Allen), Brad (Fran Doman), Sara (Frank Wesser), all of Ann Arbor, and Shelley (Dave Herrington) of Port Austin, MI; her sister Vanne (Bob Cowie); nine grandchildren and 4 great-grandchildren. A celebration of her life is planned for April 27, 2019 at the Ann Arbor Unitarian Universalist Church. Donations in her memory may be made to Legacy Land Conservancy (legacylandconservancy.org) or Packard Health (packardhealth.org). We sadly note the passing of Ed English. Wallace Edward English, known to all as Ed, passed away in his sleep in San Luis Obispo on December 4, 2018 after a short cardiac illness. He was 93. Ed was born in Westwood California in 1925. Ed served in the Royal Canadian Air Force starting in 1942 as a Wireless Aerial Gunner flying combat missions in Avro Lancasters. He then joined the United States Air Force as a Staff Sergeant in 1948, one of a few having the right to wear Canadian Wings on his USAF uniform. He completed USAF Officer Candidate School 49B in 1949 earning the rank of 2nd Lieutenant. He Retired in 1968 from USAF Strategic Air Command as Lieutenant Colonel after 21 years. Ed attended California Polytechnic State University San Luis Obispo receiving a BS in Industrial Technology and an MS in Education. Ed taught IT at Cal Poly for five years. He was then Division Chairman for the Cuesta College San Luis Obispo Engineering and Technology Division for 23 years. Most of that time he was an electronics teacher, the position he cherished the most. He retired from Cuesta in 1995 though he continued part time as Faculty Emeritus. Ed was preceded in death by his wife of 48 years, Audrey June English (McKenzie). He is survived by daughter Patricia Reimann, son Gary English, grandsons Edward English and Andrew English. Ed was very active with many interests and many collaborations and many friends. He was deeply involved in genealogical research. Ed was an Amateur Radio Operator with the call sign W6WYQ. He started with a keen interest in Crystal radios at about age 10 and joined the Amateur Radio Relay League in 1947. He was a frequent operator using Morse Code on the High Frequency bands. He performed antenna research and development including pioneering work with the Directional Discontinuity Ring Radiator with papers published in both QST and 73 Magazine. He was a close friend with Clifford Buttschard and the two helped found the Cal Poly CubeSat program and helped establish the satellite laboratory there. He was an avid automobile historian and collector of a variety of antique automobiles. Ed was a member of many organizations including The American Legion, the Native Sons of the Golden West and the 902 Wing Royal Canadian Association. He was keen with photography, astronomy, gardening, hiking and very much with fishing. He was generous donor to many causes, especially those benefiting youth. 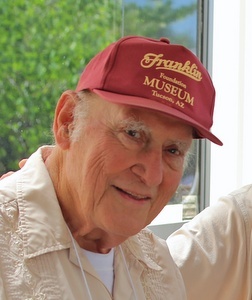 We sadly note the passing of Garnet Hantak. On Sunday, January 13, 2019, Garnet T. Hantak, wife, mother, grandmother and sister, passed away peacefully at home in Saddlebrooke AZ at the age of 86 years. Garnet will be forever remembered by her husband and best friend of 46 years, Frank B. Hantak, and their precious children. Garnet was born in Keeneys Creek, West Virginia on May 2, 1932 to Pete and Lora Pearl (Hunt) Teel. At the young age of 18 she and her oldest daughter Donna moved to Cleveland OH where she worked at General Electric for many years before leaving in early June, 1973, after meeting her sweetheart. Garnet moved to Elk Grove IL and married her best friend on July 7, 1973 where they spent 30 wonderful years with their children, before moving to Tucson AZ. Merchandise manager for the Franklin club for 20 plus years, she spent many years traveling to Las Vegas, Hershey, Pennsylvania, Iowa, Cazenovia, New York, and made many dear friends along the way. No services will take place, honoring Garnet’s last wishes.